Back in May, Jim and I made a trip to Coffeyville from Carthage to have lunch with a work colleague/friend (read about that here). While in town, we visited the Dalton Museum. 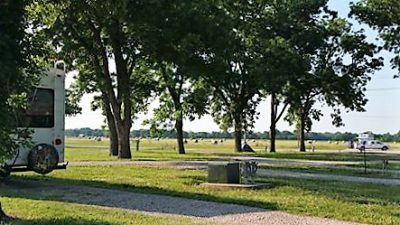 Through RVParky, we knew there was a reasonably-priced city park in Coffeyville. Since we needed a place to go mid-week after our month-long stay ended on a Wednesday, he and I decided to check out the campground. We found it to be very inviting and the $8/night price extremely affordable for 50 amp electric and water, so plans were made to go back to Coffeyville this past week. We’d hoped to connect with the friend, Lisa, again during the 3-day stay, but unfortunately she was sick. Jim and I still had fun. First thing after arriving in town again, we sought a fun, local eatery. Sunflower Soda Fountain fit what we’d hoped to find, and he and I really enjoyed a meal there. They make all desserts in house, including crusts! 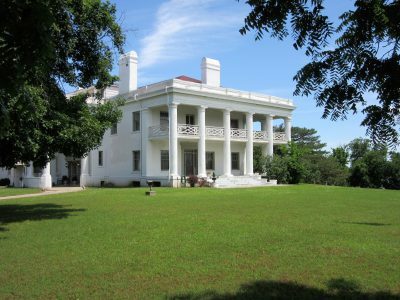 When we purchased tickets to the Dalton Museum, we learned that we could get a combo ticket at a discount to also see the Brown Mansion with no time limit on using those tickets. He and I took the 3:00 p.m. tour on Thursday afternoon. Another RV couple was also on the tour. The lady who would normally have hosted this tour was just back from a medical issue, so someone filled in for her. The gentleman, though kind and knowledgeable, was easily distracted, and he was more focused on the things in the house than telling us about the people who built and lived in the lovely, old mansion. I think Jim and I would have enjoyed it more if there had been more of a personal connection made to the people than so much emphasis on the things in the house, but I’m glad we went. Friday was an amazing day. Jim and I made the 30-minute drive to the Little House on the Prairie Museum. It is located on the place where the Ingalls lived in the Kansas Territory around 1869-70. First, it was just a beautiful day. The sky was a brilliant blue with only a few white, fluffy clouds. With plenty of rain, everything was lush and green. The breeze, which made the tall grasses and leaves on trees wave, was soothing. Having read most of Laura Ingalls Wilder’s books, it felt good to be in a spot that inspired much of her writing. Because of the detail in her books, historians were able to verify the location, using the hand-dug well as a location marker, and create replica’s of what was once there. Other buildings of significance that had been nearby, such as the post office and school, were moved to the property for preservation. We wrapped up the outing with a trip into nearby Independence where we had lunch at Brothers Railroad Inn. It was a great, short, day trip. This morning, before moving out to a location north of Wichita, we washed our RV. It had not been done since the end of February as most RV parks won’t allow washing of cars and RVs, but my wonderful husband noticed a truck wash next to a car wash just a short distance down from the park. He pulled the camper in, and she got a decent scrub. It was a beautiful and uneventful drive to our new park. For me, watching the landscape change as we went was a treat in and of itself. In the photos, notice how the grass ripples from the strong wind of the plains. Kansas is awesome so far!